The HKH region comprises regions with varying topographies and climatic conditions. There is acute need to conduct studies on the ground, collate the findings generated and use them to inform adaptation measures. 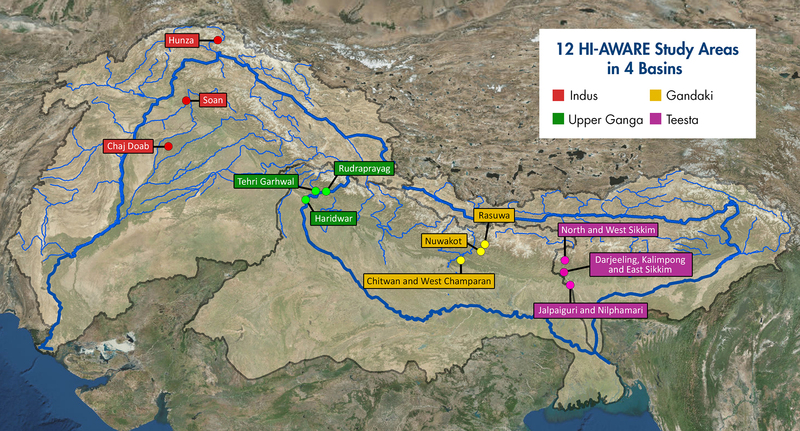 HI-AWARE will focus its activities in 12 sites that represent a range of climates, altitudes, hydro-meteorological conditions, rural-urban continuums, and socio-economic contexts in four study basins: the Indus, Upper Ganga, Gandaki and Teesta. Adaptation Pathways– sequences of policy actions that respond to adaptation turning points, by addressing both short-term responses to climate change and longer-term planning.